Enter to Win Our $5,000 Cash Back Contest! 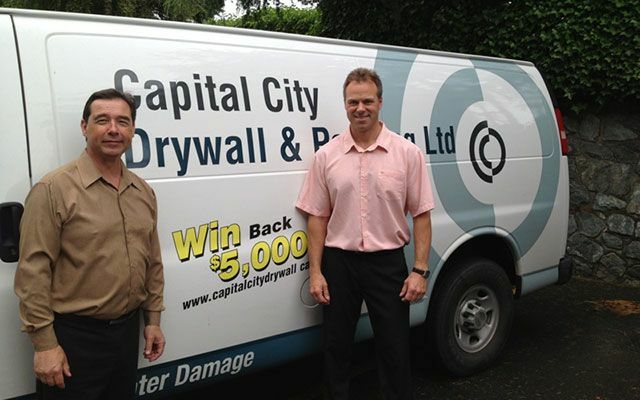 At Capital City Drywall & Painting, we know how expensive residential and commercial restorations can be. That's why every year we offer a $5,000 cash back contest, where you can win back up to $5,000. Our contest is open to all residents of Victoria and the surrounding areas. Enter to win today by simply filling out all fields on the eform located on this page. For questions about contest details, feel free too contact us. 2017 Winner of the $5,000 win it back contest won back the full amount of her drywall and painting renovation. 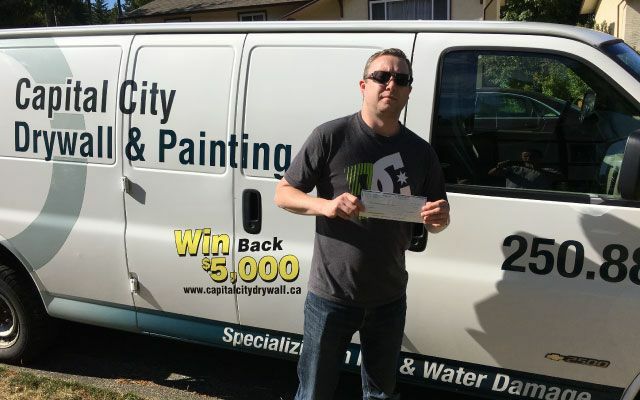 2016 Winner of the $5,000 win it back contest won back the full amount of his drywall and painting renovation. 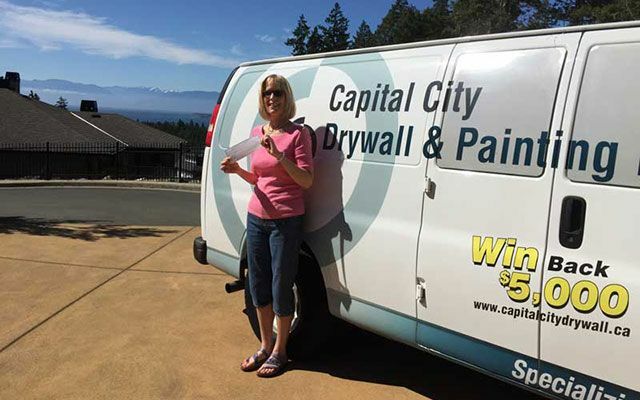 2015 Winner of the $5,000 win it back contest won back the full amount of her drywall and painting renovation. 2014 Winner of the $5,000 win it back contest won back the full amount of her drywall and painting renovation. Congratulations to Dr. M. Schleining! 2013 Winner of the $5,000 win it back contest won back the full amount of his drywall and painting renovation. 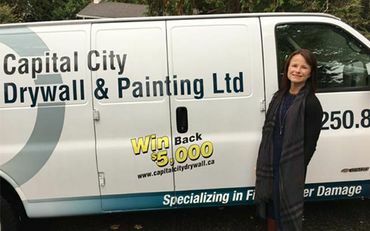 1.1 Eligibility: The $5000.00 Cash Back Program Contest (the "Contest") is open to all residents of Canada who have reached the age of majority in their Province of residence, except employees, retirees of Capital City Drywall Ltd. ("CCD") and its affiliates, agents, associates, dealers, representatives, advertising and promotional agencies and members of the immediate family of these employees and retirees or any person with whom they are domiciled ("Customers"). 1.2 Contest Period: Starting on May 22, 2018 12:00 a.m. Pacific Time, ending May 21, 2019, 11:59 p.m. Pacific Time. The Prize will be drawn by June 30, 2019 before 5:00 p.m., ("Draw") All entries must be received by 12:00 a.m. June 21, 2019. 1.3 Contest Entry: After receiving your invoice for work done by CCD, go to our web site www.capitalcitydrywall.ca and complete the online entry form. 1.4 Upon completion of entry eligible Customers will be entered into the Contest for one (1) chance to win the Prize per invoice dated during the contest period. 1.5 Contest Entry Restrictions. Duplicate entries indicating the same invoice number, for purposes of the Contest, are deemed to belong to the same Customer and therefore are subject to the above restriction (1.4). Any excess entries will be invalid for purposes of the Draw. 2.1 Prize: The Contest has one draw. If your invoice number is drawn you will win the amount of that invoice including GST up to a maximum of $5,000.00 CND. If you have multiple invoices entered you will only win the amount of the invoice drawn up to a maximum of $5,000.00 CND. 2.2 Draw: There will be one random draw. The Prize must be accepted as awarded. No alternatives, substitution or transfers of the Prize will be allowed. The Prize will be forwarded to the winner within five days (5) from the date that CCD makes contact with the Customer whose name appears on the winning invoice. 2.3 Odds: The odds of being randomly selected to win the Prize depend on the total number of eligible entries received during each applicable Contest Period. 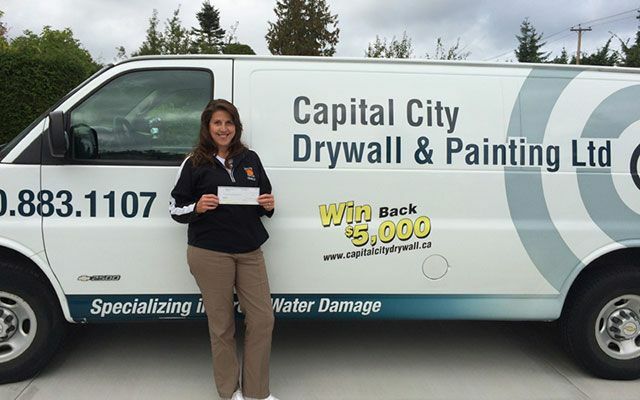 3.1 Each Prize claim is subject to verification by Capital City Drywall Ltd. and/or its designated representatives. Entries made with multiple addresses, under multiple identities, or through the use of any device or artifice to enter multiple times or entries that are in excess of the permitted number of entries during the Contest period are automatically void. All Contest entries obtained through unauthorized sources or which are incomplete, illegible, mutilated, altered, reproduced, forged, irregular or fraudulent in any way or otherwise not in compliance with these Rules are automatically void. Capital City Drywall Ltd. will be the sole and final reference source in validating a Prize claim. 3.2 By participating, each Customer and selected winner agrees: (a) to be bound by these Rules and the decisions of Capital City Drywall Ltd. in interpreting and applying these Rules, (b) to release and hold harmless Capital City Drywall Ltd. , its affiliates, subsidiaries, and independent contractors, and their respective directors, officers, employees, agents and representatives including advertising and promotion agencies, from any and all liability for claims/damages including, but not limited to, claims/damages for personal injury, or property damage with respect to acceptance, possession or use or misuse of the Prize or participation in the Contest; (c) if he/she wins the Prize, to permit Capital City Drywall Ltd. to use his/her name, city of residence, photograph, video, or any likeness for advertising or publicity purposes without any additional compensation. 3.3 The decisions of Capital City Drywall Ltd. in relation to this Contest will be final and binding on all entrants. 3.4 Capital City Drywall Ltd. shall not be responsible for incorrect or inaccurate transcription or registration of Contest entry information, technical malfunctions, lost/delayed data transmission, omission, interruption, deletion, defect, faulty, incomplete, incomprehensible, or erased computer or network transmissions, line failures of any telephone network, failure of computer equipment, software, inability to access any online service or web site, inability to submit the online survey, or any other error or malfunction, or any injury or damage to entrants or any other persons computer related to or resulting from participation or downloading any materials in this Contest, or for late, lost, stolen, postage due, illegible or misdirected entries. 3.5 Capital City Drywall Ltd. will not be responsible for lost, stolen, illegible or destroyed purchase receipts. 3.6 Capital City Drywall Ltd. reserves the right to cancel, terminate, or suspend this Contest, at its sole discretion, in the event of a technical failure, computer virus or bug, unauthorized human intervention, fraud or any other occurrence or cause beyond its control that corrupts or adversely affects the administration, security, fairness or normal operation of the Contest. 3.7 If a selected entrant is awarded the Prize due to a system error, malfunction or defect the Prize will be returned to the Prize pool, to be re-awarded. 3.8 Under no circumstances will Capital City Drywall Ltd. , its affiliates, subsidiaries, and independent contractors, and their respective directors, officers, employees, and agents, including advertising and promotion agencies be required to award more Prizes than what is indicated in these Rules or award the Prizes other than in accordance with these Rules. 3.9 No purchase is necessary. One write-in entry per person or entity is permitted. A write-in entry must consist of an individually signed letter by the person or entity to Capital City Drywall Ltd. that must be mailed to Capital City Drywall Ltd. with an email address. Capital City Drywall Ltd. will then provide that person or entity with an invoice number, which that person or entity can use to enter the contest on the Capital City Drywall Ltd. website. The amount of the invoice, and the amount of the Prize that will be awarded if a write-in entry wins, is $5.00 CND. 3.10 The Contest is subject to all Federal, Provincial and local laws, as well as the rules adopted in view of said laws. The personal information provided to enter the Contest will be used only to administer the Contest, and for no other reason.